Delhi Photo Diary: Theme day: No! I've always thought of such signs as an invitation to begin negotiations! A very different 'No' sign! I find haggling over stuff a very difficult thing to do. We are far more used to fixed prices here in Australia! This quite an unusual sign for a no. It is inviting to try the opposite. I see you found an adorable No sign. No bargaining means no business or does it work? It is almost funny to think of adult people scurrying around their communities taking pictures of signs. And if somebody had asked what that is all about and you said a sign with "no" on it, they might... well. It is kind of funny. Haggling is not an easy thing to do; I think I'd find it exhausting if I had to haggle every day. Great photo for this theme! 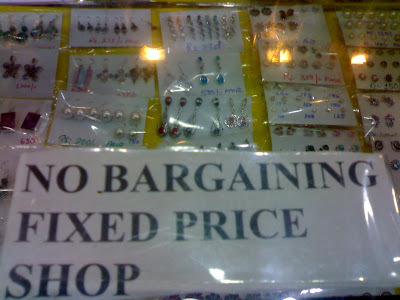 When I lived in India, I had to learn to bargain. When I saw a sign like this, it was a relief to just "pay and go" - that's the American in me, I guess. Great post. I remember when I worked for a short time as an employee trainer at a retail fabric store located in a popular tourist area in San Francisco and visitors from countries where marketplace bargaining is the norm would come in and start to haggle about the price per yard. The young and untraveled American sales clerks regarded the behavior as next to criminal and very shifty, not being familiar with customs elsewhere. It was a good education to have the world at our doorstep and learn from so many amazing people that different is not wrong, just different. I'm afraid the customers were disappointed that the only discounts offered were if there was a flaw in the fabric or for bolt ends where if you needed, say, two yards and there was 1/2 a yard left on the bolt, the clerk could offer that extra 1/2 yard at half price. Needless to say, such confusing mixed messages didn't go over well, and the clerks were thought shifty by the customers. So much for international relations on the small scale! I guess no one likes to hear "no." This is a sign I'd like to hang in my shop! Why is it people seem to think "they" are special and should be "entitled" to a better deal?? Sorry, this is one of my hot buttons! Thanks for your visit and comment today. To answer your question about the No Killing sign, it is a political statement and the number refers to USA military dead in the Iraq war.